Providing the electrical earthing services our customers require is the number one of the priority at E&S Earthing Solutions. In meeting our commitments to providing full-service electrical earthing services and the best electrical engineering earthing design services available, we use the latest computer modeling software from Safe Engineering Services & Technologies ltd. (SES TECH). This is the same world-class software used by electric utility companies around the world for designing their own substations and transmissions lines. By partnering with SES ltd., E&S Earthing Solutions offers this same power for use on your site! This on-the-job reference offers complete coverage of all technical aspects of electrical earthing and bonding. 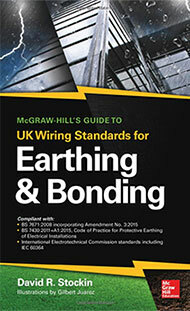 The book provides you with the commentary and guidance you need to interpret and apply the earthing and bonding requirements of the 17th Edition of the IET wiring regulations (BS 7671:2008 incorporating Amendment No. 3:2015)―the electrical code used throughout the United Kingdom.